For birds the biggest giveaway that autumn has arrived is the decrease in daylight hours. For many birds this means it’s time to get out of town and head south, but for birds that winter here like Tufted Titmice, Black-capped Chickadees, White-breasted Nuthatches, Woodpeckers and Blue Jays, it means it’s time to stock up on food for the upcoming winter. This is also known as caching. September through December is peak caching time for some of our favorite birds and these birds can store anywhere from hundreds to thousands of separate caches scattered around their home ranges (your backyard and neighborhood). Take notice of how many of your feeder birds spend less time staying and eating their seeds and nuts at your feeders and instead make repeated quick visits where they fly in and quickly leave with their food. Some birds like Blue Jays may actually stay longer as they stuff their mouths with as many seeds as possible. In fact, Blue Jays have been known to stuff up to 100 sunflower seeds in their mouths before setting off to hide them. 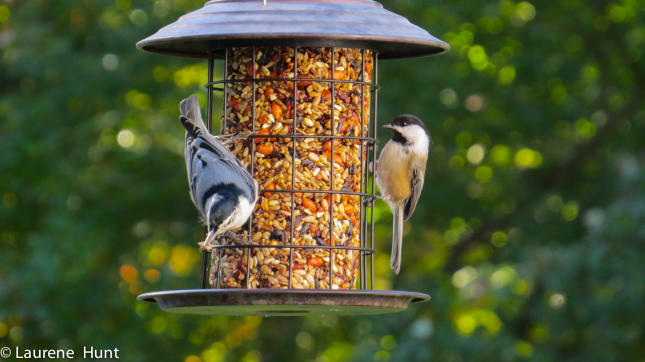 Chickadees, Nuthatches, Titmice and Woodpeckers store their seeds and nuts under tree bark and knotholes; and even under roof shingles, house siding and eaves. Some birds hide seeds by covering them with leaves, moss or grass. Blue Jays often bury their cache in the ground. Birds also remember key landmarks such as rocks and shrubs that surround their cache locations.